Strong winds and heavy snow will continue in the capitol region before ending this afternoon. 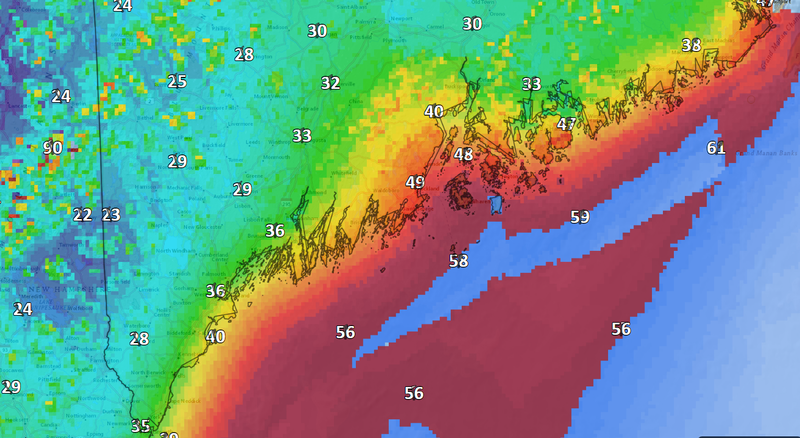 A large and intense ocean storm continues to bring snow and wind to Maine for Monday. The latest radar shows the heaviest snow east of Augusta as of mid-morning Monday with pockets of moderate snow bursts in southern Maine that will continue to lessen in both intensity and frequency for the rest of the day. The storm responsible for all the snow continues to move east and become stronger. You can see how wrapped up the system is on this satellite loop which actually shows available water vapor in the storm itself. The snowstorm was going strong for much of the morning with heavy bands of snow rotating down the coastline and through much of southern and central Maine. The highest accumulation totals so far around Greater Portland are about 15 inches. Many towns picked up another 2 to 5 inches of snow during the morning bringing several areas up to final totals of around 20 inches. Portland would need to get 21 inches of snow for this to be a top 10 storm. While the majority of the snow was on the ground by about 8 a.m., bands of heavy snow continued at times, creating near blizzard conditions. These ribbons of heavy snow are expected to be more sporadic for the remainder of the early afternoon. At times the snow will let up or even completely stop before resuming in full force. After 1 or 2 p.m., as the storm pulls away, the snow will end in southern Maine. The forecast radar loop below shows how the snow is forecast to move out to sea during the day. This image goes through 10 p.m this evening. The map below gives a general idea how much more snow you can expect from about 8 a.m. until it ends this afternoon. I put 2 p.m. on the map, but there might be some snow showers beyond that time. This is an estimate. Some places may be over these amounts if a heavier burst of snow rotates through. With the wind increasing and the snow very light and fluffy, visibility will fall to near zero during some of these heavy bursts. Travelers should be aware of rapidly changing conditions throughout the morning. As the storm increases in intensity the wind will also increase. This could create scattered power outages, although winds will not be as strong as earlier forecasts had them a day or two ago. Tuesday brings back the sunshine and less wind. It will be a great day to enjoy the new snow and continue to dig out. There is more snow in the forecast for Wednesday, but this won’t be a major event. 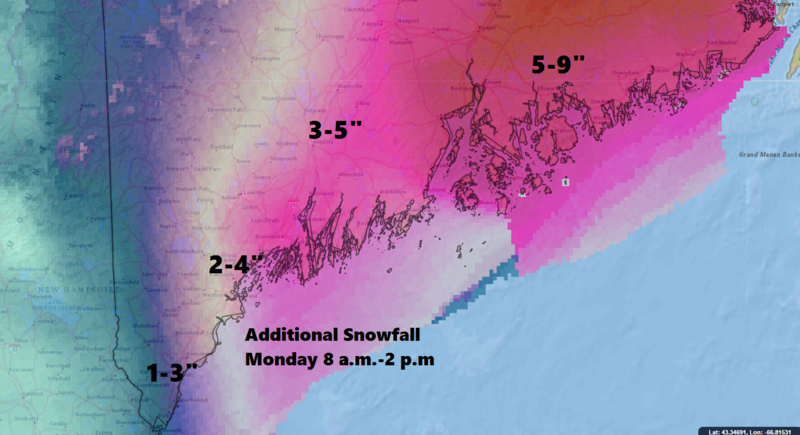 Right now I am expecting 1 to 3 inches over southern-most Maine with 2 to 5 inches elsewhere. A dry weekend is ahead and we are looking at some great February vacation ski conditions. Comfortably cold temperatures and a relatively tranquil weather pattern should make next week an ideal one for all winter sports enthusiasts.